This study aims to determine the direct influence of (1) participation in school quality, (2) the cost of education with school quality, (3) community participation with the costs of education. The method used is survey method with the correlational approach. In this study were used as a sample of 63 principals were selected based on random techniques (simple random sampling). Data were obtained by spreading questioner. 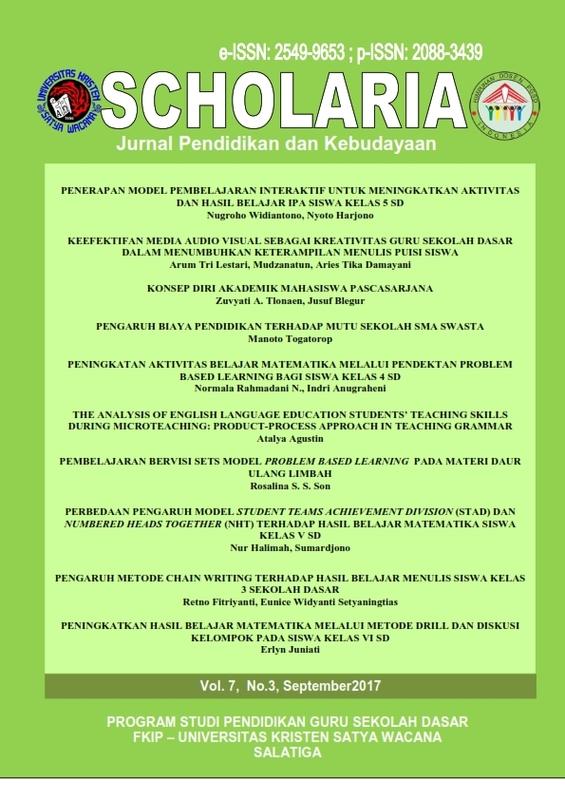 This research was conducted in the district of Tangerang.Based on hypothesis testing that has been done, it can be described findings of the study as follows: (1) there is a direct positive effect between participation with school quality, (2) there is a positive direct influence between the cost of education with school quality, (3) there is a direct influence Among positive community participation with the costs of education.The implication of this research is the effort to improve school quality can be done through increased community participation and education expenses. Baker, Bruce D. 2012. Does Money Matter In Education ?. NewJersey: The Albert Shanker Institute. Bond, Sharon & Michael Horn. 2009. The Cost of a Free Education. Australia: Brotherhood of St Laurence . Bruce, Fuller. 1986. Raising School Qualityin Developing Countries: What Investments BoostLearning?. Washington, D.C.: The World Bank. Bruce, Johnstone D. 2003. Sociologicky Casopis/Czech Sociological Review. USA: State University of New York at Buffalo. Cook, Mark. 2009. Personnel Selection, Adding Value Through People. Oxford, USA:Wiley-Blackwell. Gibbons, Stephen & Olmo Silva, 2009. School Quality, Child Wellbeing and Parents’ Satisfaction. London: London School of Economics. George, Holmes M. 2003. Does School Choice Increase School Quality?. USA: Department of Economics, East Carolina University. Goetsch, David L. 2000. Quality Management. New Jersey: Prentice Hall. Gryna, Frank M. 2007. Juran’s Quality Planning and Analysis. New York: McGraw Hill. Hallak, J. 1969. The Analysis of Educational Costs and Expenditure.Unesco: International Institute for Educational Planning. Harold, Alderman, dkk. 2001. School Quality, School Cost, and the Public/Private School Choices of Low-Income Households in Pakistan (Philippines: Journal of Human Resources spring :304-326. Pasi, Sahlberg. 2007. Education policies for raising student learning: the Finnish approach. Washington, DC, USA: World Bank. Psacharopoulos. 1987. Economics of Education. Washington, DC: The World Bank. Reddy, Sujata. 2007. School Quality: Perspectives from the Developed and Developing Countries. USA: Azim Premji Fundation. UNDP, BPS, BAPPENAS. 2004. Nationa Human Developmen Report 2004. The Economics Democracy Financing Human Development in Indonesia. Jakarta: BPS-Statistik, Indonesia, Bappenas, BPS.